Coyote in Provence - Xunaira J. What's more amazing than visiting places of your choice in your imagination. I always wanted to visit France and with this book, I had an amazing time visiting places that I've never been to and tasting scrumptious, delicious and mouthwatering delights. Dianne has done justice to France itself. 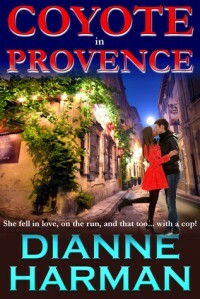 Although I haven't read the first in this series but reading Coyote in Provence as a standalone book was a great experience. Elena and Jordan kept me captivated until the end. I was wondering what would be the climax? Would Jordan find out who Elena really was? Will he help her or leave her because of her past? I wanted all these questions answered but I loved the reckless relationship they had and how they uncovered the theft of the paintings. Ms. Harman has a great gift of writing a compelling story. I'm looking forward to reading the next book in the series.